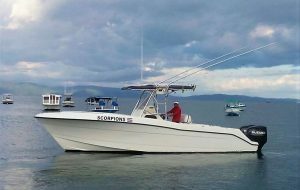 This 29ft Center Console Hydra Sport Fisher powered by two Suzuki 300HP outboards is skippered by Captain Diego Chavarria (recommended by Captain Bobby McGuinness) with 15 years experience in the area. She offers 360-degree fishability; a new bimini top providing shade; a portable head; a full range of the latest Shimano gear perfectly suited to both offshore and inshore fishing; a live bait well; outriggers; fishfinder/GPS, and the latest in electronics, including UHF/VHF radio. The boat also charters out of Golfito at a small extra cost.